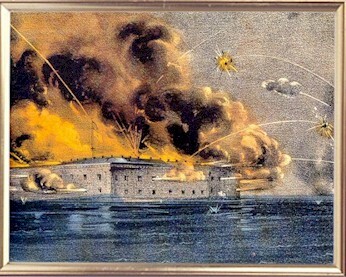 Firing on Fort Sumter: 'The Opening Ball"
Firing on Fort Sumter: "The Opening Ball"
On April 13, 1861, Fort Sumter fell to the Confederate bombardment, and The Charleston Mercury declared it to be "the opening ball of the Revolution." On Saturday, April 13, 2019 at 7 pm we will recreate the patriotic fervor and war fever which swept South Carolina, as we enjoy the grace and beauty of a Victorian Ball with dancing and refreshments. Join the Gen. States Rights Gist Camp 1451, S.C.V., at Spartanburg's historic American Legion Hall in Duncan Park, for our thirteenth annual event featuring period live music by the Blue Ridge Rounders. Practiced dance masters will instruct guests in the mystery of nineteenth century etiquette, and the mastery of the Victorian ballroom. Period military or civilian attire is welcomed, but weapons, strong drink and tobacco are not. This family event is appropriate for reenactors, historians, dance enthusiasts, lovers of old-time music, and anyone who enjoys a good party. Come and see how our Confederate ancestors celebrated the fall of Fort Sumter, and reveled in the rise of their Southern nation. Click on "Photo Gallery" above for pictures from previous Balls.